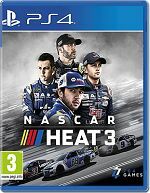 There are more ways to race than ever before in NASCAR Heat 3! Build your own race team and compete in the Xtreme Dirt Tour in the newly expanded Career Mode. Prove you are the best driver in the world in the new Online Tournaments feature. Just like real life, new at-track stories mean anything can happen on race day. Plus, all your favorite modes are back and better than ever - including Split Screen, Challenge, Championship, 40-player online, and more. Buckle up, NASCAR HEAT 3 is the racing game you've been waiting for! Xtreme Dirt Tour - In addition to the 3 NASCAR National Series, players can sling some mud in this all-new dirt racing circuit. Online Tournaments - Compete against others from across the globe. Lay down a great race time and qualify for the Finals in your skill bracket. Win your bracket for ultimate bragging rights! 8 New Tracks - Including dirt racing at Bristol Motor Speedway and NASCAR Heat's first-ever dirt road course. The final Charlotte Motor Speedway ROVAL and the ISM Raceway have also been added. Deeper Career Mode - Make a name for yourself in the Xtreme Dirt Tour and advance to NASCAR's 3 National Series. Sign contracts with the biggest racing teams in NASCAR or start your own team!